I was excited to see that Baking With Spirit has pulled in some visitors from the continent: Karin from Sinnesfreuden baked these incredible Tiny Champagne Cakes. As you can see from the picture, they're the size of a thimble! The white chocolate on the bottom makes them an all the more tempting aperatif. 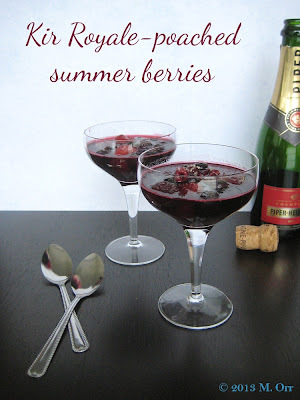 Mel at Sharky Oven Gloves was surprised to find champagne left in her fridge after New Year's Eve, but this seems to have been no bad thing in the grand scheme of things as she was able to make these mouth-watering Kir Royale Poached Summer Berries. It looks like this would go well with ice cream - now all I need is a fancy glass and summer time! Next, Craig from The Usual Saucepans decided it was high time to enter a blog challenge - I think he made the right choice, don't you? 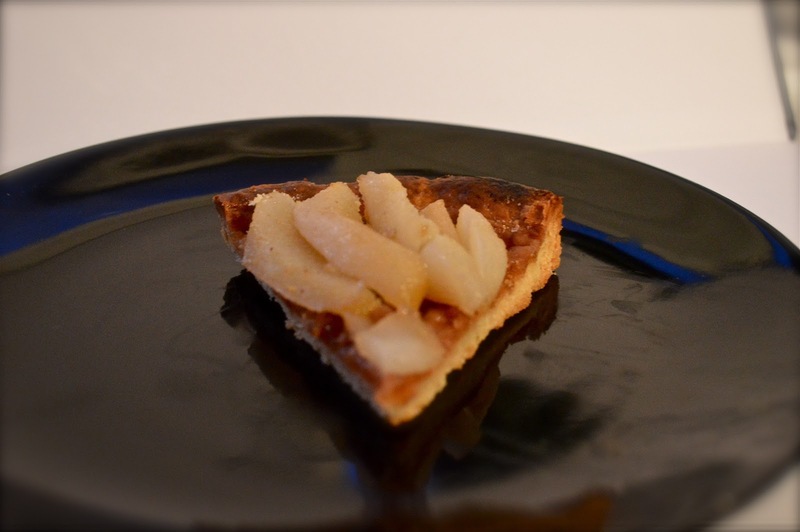 He made this very attractive Champagne-Poached Pear Tart, and I'm all the more impressed because he made his own pastry (I'm lazy, ok?). We have a rare but very welcome savoury offering now, from Anne at Uni Homemaker. 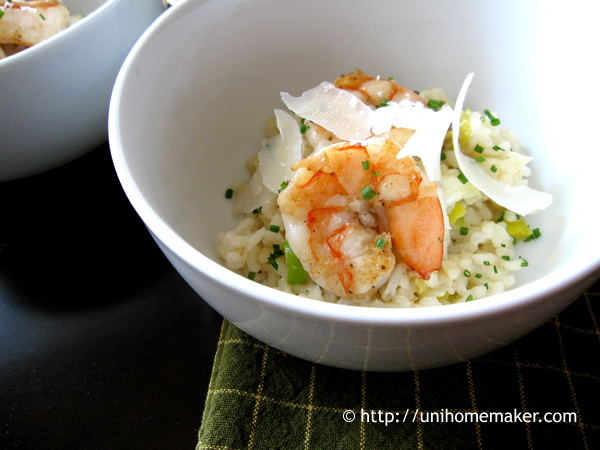 She made this beautifully presented Shrimp, Leek and Prosecco Risotto - I'd never have thought to use prosecco with risotto, but now I think about it I suppose it's just like using a really fancy white wine, isn't it? After my exams I decided to make a Celebration Cake With Kir Royale Icing. It didn't go quite as imagined, but it still looks the part and, despite the pancake-flat sponge layers, tastes pretty good. I know Kir Royale isn't strictly champagne, but I forgot to get a mini bottle of the real deal and so had to make do with the cheapest derivative I could find in the supermarket. Ellen at Bake It With Booze made these Pink Champagne Cupcakes With Strawberry Buttercream for a very good cause indeed. They were made for Frosting for the Cause, a website where each post involves a personal story about a woman in the author's life who fought breast cancer. The author donated $25 to women's cancer charities as well, so with 365 posts a year they manage to raise an an awful lot - a brilliant idea if ever there was one, though after two years the site was unfortunately shut down. The cupcakes look light, fluffy, and delicious too - champagne and strawberries are a winning combination, after all! A special mention also has to go to Lucy at Supergolden Bakes because I know that she really made the effort to make something for this month's challenge, but unfortunately the recipe wasn't written well and she ended up with a nasty tasting cake and some slushy icing. I do appreciate the hard work that went into it, though! Many thanks to all of you who took part, and to those who didn't... well, there's always next time! 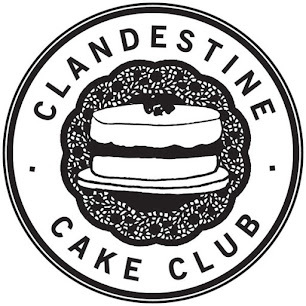 Check back here tomorrow evening to find out what I'll be challenging you to bake with next month - not even I know what it is yet as it's very dependent on what is stocked in my local supermarket. A surprise for everyone! Great write up this month, Janine! Super impressed with all the contributors...I'm especially intrigued with the risotto--something I will try for sure. Photos are great everyone! Cheers to you for making it another year!! See you all next month! Lovely round up Janine! Thanks for posting. What an exciting round-up – I'll have plenty of ideas to turn to next time I find myself with some champagne that I don't know what to do with (although that's unlikely to happen any time soon…). How exciting that you're all done with exams now – huzzah!